Info-graphic or Information graphic, are graphic visual representations of information, data or knowledge intended to present complex information quickly and clearly. They can improve cognition by utilizing graphics to enhance the human visual system’s ability to see patterns and trends. The process of creating info-graphics can be referred to as data visualization,information design, or information architecture………Sounds boring doesn’t it? Of course it does, but it can actually stand to make your website more exciting. To put the above paragraph in simpler terms an info-graphic takes data (usually numerical, statistics, ratios, etc.) and puts it into a fun and easy to understand picture. 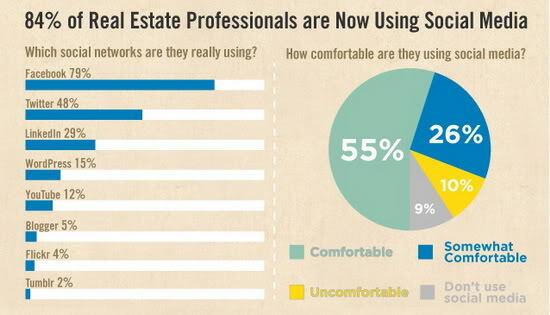 Here is an example of an info graphic depicting Social Media use as it relates to the Real Estate industry. Simple, to the point, and most of all it’s interesting! What took me an entire page of text to explain can be done in seconds with a simple picture. We live in world of instant gratification. People want you to get to the point immediately or they’ll lose interest. Placing an info-graphic on your website will not only help you organize your information into an easy to understand format but it will also help you keep the reader’s attention. Chances are the info-graphic in the center of the page is the first thing you looked at and from there you decided to read the text. As a Realtor you should use this to your advantage. So how can you as a Realtor use info-graphics? Any way you want to. I’ve seen them used to announce new listings, community updates, and used to chart a certain Realtors success for the past few years. The uses are only limited to your imagination. Here are a few sites that will help you design an info-graphic quickly. Each has its own unique graphic generator but all create quality info-graphic. Try all and see which one you like the best! This entry was tagged Business, Commercial real estate, Data, design, graphic generator, Infographic, Information graphics, Information Visualization, instant gratification, Knowledge Discovery, Knowledge Management, Marketing, National Association of Realtors, numerical statistics, Real Estate, Real Estate agent, Real estate broker, real estate media, real estate search, real estate tech trends, realtor real estate, Realtor.com, residential real estate, social media. Bookmark the permalink.